The Martial Arts Academy is recognized first and foremost for its long lasting tradition of producing highly skilled and knowledgeable martial art students. This has earned the academy recognition nationally as a leading school of martial arts training and education. 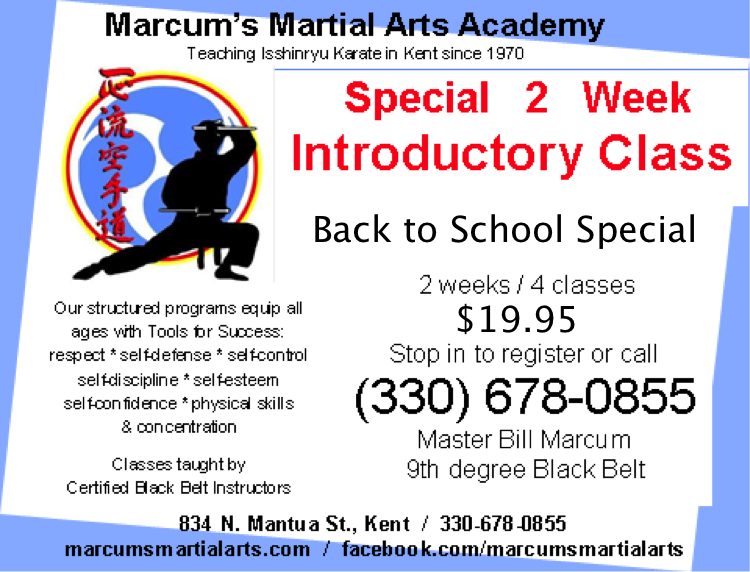 Serving the Kent area since the 1970's, the Marcums have produced Karate champions at the local, state and national levels for many years. Some of their highly skill athletes have also successfully competed in elite international competitions representing the USA at home and abroad. The Martial Arts Academy's traditionally based structured programs prepare students of all ages for the demands of school, work, and daily life. The structured programs teach students the tools for success, leadership skills, fitness and conditioning, stress management, conflict management, self defense as well as other essentials that help create a complete martial artist. Quality demands time, practice and commitment. Everyone appreciates quality, but not everyone has the perseverance to attain it. The Marcum’s Martial Arts programs maintain the highest standards of martial arts training while providing a friendly, fun, family atmosphere for learning and training. The professionally trained and certified instructors are dedicated to making your martial arts training one of your best experiences ever. The academy's motto of 100 times patience teaches students and instructors that success takes time. The master instructors maintain a personal commitment to each and every student individually, thus creating a Martial Arts Family. Regardless of your goal, the Martial Arts Academy can help you attain it. The journey of a thousand miles begins with the first step.